WordPress is a content management system that is simple to use, flexible and powerful, and will do pretty much most of what you might want to do with your blog or website. So far there are over 60million sites built with WordPress. 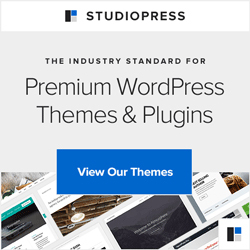 And within this excellent system, we use the StudioPress Genesis framework (for the design side of things), choosing from their range of fast, responsive themes to develop one that will work best for your business. We’ll be running a series of blog posts that help you create your own website, then bring these together into a “website in a day” workshop. From £800 we put together something straightforward and simple that will provide you with a starting point for your project. This will include your theme, WordPress installed, the best plugins to look after things for you, and setting up some initial pages ready for your content. Hosting for one year is also included with subsequent years at £75/year – this includes maintenance of the site/plugins/theme if provided by us. At £1300 and above, your website will be more business-ready, more pages, more functionality and more customisation of the design for your branding. Then if you want a more powerful business website, one that includes for more integration with your social media, that has more levels of content set up for you, that can include for some basic online payments (using PayPal) or a more detailed form for your visitors to complete, or survey – you get the idea – a more pro-active website than the simpler business brochure above. Well this is likely to require £2500 and more, depending on your needs. Remember, these prices are to give you an idea of what your budget can buy you, and your particular needs are considered before a firm price is set. Email Barbara via hello@blogmistress.com with your ideas, needs, wants and intentions, and she’ll get back to you with some suggestions.